Carpooling can take the bite out of your daily commute. By dividing driving responsibilities among fellow parents of preschool students, you may simplify school mornings. It can be the perfect solutions for some families, while it’s a burden for others. It depends on your preferences and unique situation. Here are some pros and cons worth considering as you decide whether it’s a good fit for your family. One demand of carpooling is that the driver of the day must be punctual. If you are late on days when you are responsible for carpooling other kids, you can make several kids late and their parents angry. If you struggle with being punctual, that’s a trait you should probably strive to improve, and you may want to wait until you have made significant, consistent improvements before taking on carpooling responsibilities. If several families each have a long drive to the preschool, it will be more fuel efficient and better for the environment if you all carpool together. That way, only one car is making the trip each day, and a significant amount of resources can be saved over time. If you are simply driving around the corner, the impact will be less, but it’s up to you to decide whether it’s worth it for this and other reasons. It’s not easy to rely on other people, and carpools require that. The carpool arrangement can’t go on indefinitely, and when a family decides to move or their kids switch schools, that can cause upheaval in the schedule. You would then have to reconfigure and agree to a plan that works for the remaining families. When you simply drive your own kids to school, you don’t have to factor in other families’ changes. When you carpool, it provides yet another opportunity for your children to build their social skills. Kids who drive to school together every day may have an easier time chatting at preschool and feeling comfortable with each other. Carpooling can help your children form friendships and get to know their peers in ways they would miss out on if they weren’t carpooling. Although carpooling can give you more freedom on days when other parents are driving the carpool, your own freedom and flexibility will be curtailed on days when you need to drive your kids and other students to preschool. You will need to leave at the same time every day, whereas, if you were on your own, you may choose to take care of errands near your kids’ preschool before going home. Not only will carpooling allow your kids the chance to interact with their peers, but it also gives them the opportunity to deal with authority figures other than teachers and parents. 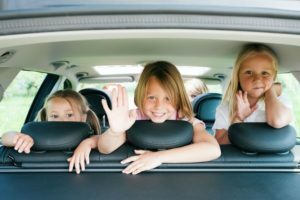 A carpooling parent may not exactly be a mentor, but it can be good for children to behave respectfully and get comfortable around others in a position of authority. They may love attention from other adults, too. Finally, keep in mind that carpooling in the Washington area can help your kids get more from the daily commute to preschool. It’s not for every family or every child, though. You need to assess your needs as well as the needs of each of your children before deciding whether it’s worth a try. Kid’s Country Learning Center has convenient locations for families in the greater Seattle area in Tacoma, Woodinville, Maple Valley, Monroe, Issaquah, Everett, Burien, Canyon Park, Auburn, and Bonney Lake.